We invite all singer/songwriters to join us for this Thursday's open mic night, a.k.a. Living Room Live. Named Creative Loafing's Best of the Bay 2014 and 2017 for "Best Open Mic Night", the Hideaway Cafe has opened up its doors and its stage for the past 8 years to countless rising talents as well as seasoned veterans who have made a career of music. Consumate host John Kelly, a singer/songwriter himself, started this weekly tradition 9 years ago after building a stage as an extension of the recording studio. And the rest is history. The talent has been immense, the highlight reel endless... and the memories priceless. You won't find a more appreciative audience than you will here at St Petersburg's Original Listening Room! Come down and check in with Rebekah and get on the list. The list is now built using a lottery system in an effort to keep the night open to newcomers and to keep every Thursday new and exciting. This also encourages artists to support and get to know one another. Countless collaborations and musical relationships have been built on chance encounters here at "Living Room Live". For signup - you have an option to choose one of two time frames. Basically EARLY (7pm-9pm) and LATE (9:15 - close). Your name is pulled out of a hat and you have 15 minutes to do your thing. You can drop your name in starting at 6pm. Then singer/songwriters take the stage to share 2-3 original songs and then "pass the mic" so to speak. The signup pool fills up fast so be sure to get here early and be sure you are here for your chosen time frame. Artists - if you'd like to get the recording studio "in the red" for your set, be sure to indicate that when you sign up (solos only). For as low as $35, you can have files of your performance dropbox'd to you or handed over on a special keepsake "hideaway" flash drive. Be sure to leave your email and phone number if you choose to record. Invite your favorite music loving friends out for some incredible original music from some of St Pete's finest! 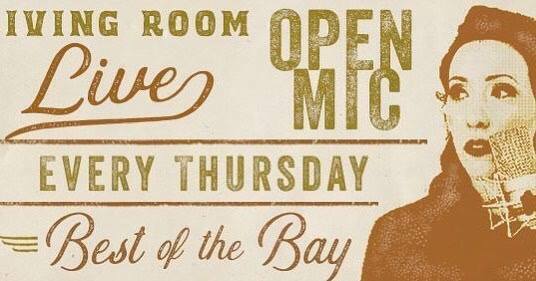 As always Thursdays are free so come on out and get a taste of what St Pete's Original Listening Room is all about.